What does Namaste mean? | Law of Attraction Plus: The Secret revealed! 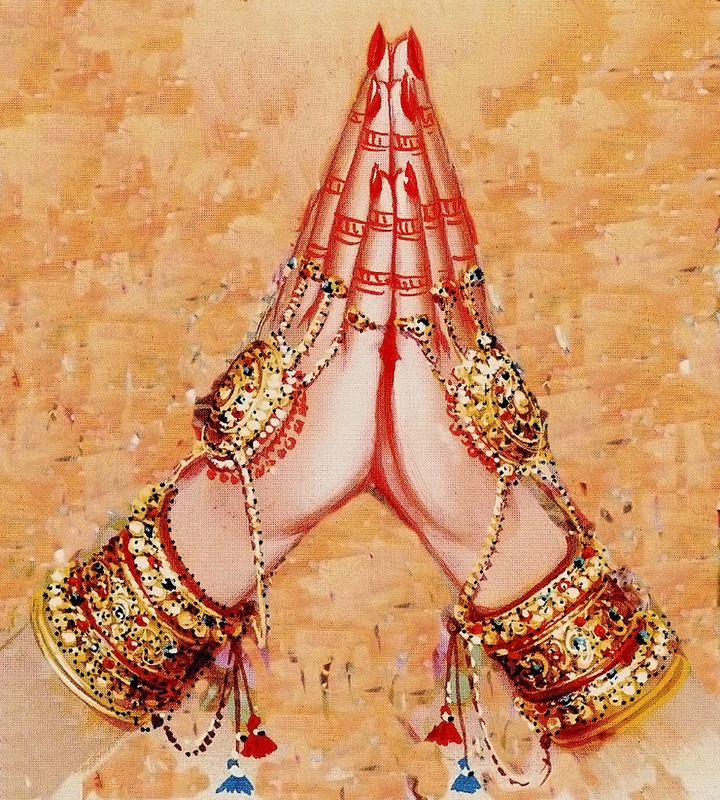 Namaste is a common spoken valediction or salutation originating in the Indian Subcontinent. It is a customary greeting when individuals meet, and a valediction upon their parting. A non-contact form of salutation is traditionally preferred in India and Nepal; Namaste is the most common form of such a salutation. When spoken to another person, it is commonly accompanied by a slight bow made with hands pressed together, palms touching and fingers pointed upwards, in front of the chest. This gesture, called Añjali Mudrā or Pranamasana, can also be performed wordlessly and carries the same meaning. 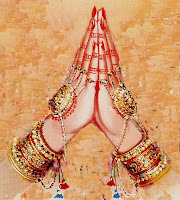 Namaste is derived from Sanskrit and is a combination of two words, "Namaḥ" and "te". Namaḥ means 'bow', 'obeisance', 'reverential salutation' or 'adoration' and te means 'to you' (dative case of 'you'). Therefore, Namaste literally means "salutations to you". 'Namaskar' is derived from Sanskrit and is a combination of the two words, "Namaḥ" and "kaar". As noted above, "Namaḥ" is a salutation. "Kaar" means 'form' or 'shape' and refers to the phenomenon that the other entity (person) presents. Thus, the older salutation essentially means "I salute [your] form", which implies an understanding that all beings in this existence are part of the surface phenomenology of Maya and that beyond the surface, so to say, all beings are part of Brahman, or the One ultimate essence that underlies, and is, all. In the same light, 'Namah' originates from a benevolent unselfishness or admission ("salutation") of unity in One essence, and, therefore, 'Namaste' can also be interpreted (roughly) as a way of saying "Not-myself to you" (a benevolent expression of both respect and impersonality). Another variation "Not for me,.. but for thee" gives the sense of doing 'in service' or 'in honor' of the person spoken to, removing any personal agenda of the speaker. The gesture is widely used throughout Asia and beyond. It first appears c. 4 000 years ago on the clay seals of the Indus Valley Civilization. In India and Nepal, Namaste is a friendly greeting in written communication, or generally between people when they meet. When used at funerals to greet the guests, the verbal part is usually omitted. When the hand position is higher, it usually means reverence for worship. Thus, The expression with hands placed on top of one's head is usually the sign of utmost reverence or respect. In Nepalese culture, namaste is performed when a younger family member meets older relatives. It also varies depending upon social status and prestige. The person with lower status or prestige performs namaste first to show respect for the higher station the other person has achieved. It is also performed for praying and worshiping god. In Sikh scripture, Namaste, Namastung or Namastvung is referenced as salutation to the Primal being, the One God. The salutation is followed by an attribute respecting a quality of the creator of all religions, Akal. Sikhs also fold their hand as in Namaste, but their greeting is Sat Sri Akal. In Sindh, today Pakistan, the añjali mudra, though extremely rare, is still maintained even Sindhi Muslims. In Telugu culture, the gesture is known as "Namaskaramulu" or simply "Namaskaram", which are derived from Sanskrit. In Tamil culture, the gesture is known as Kumpiṭu (கும்பிடு), which is composed of two words Kumpu (கும்பு) meaning 'to cup hands' and Iṭu இடு meaning 'to do'; while an equivalent of the salutation would be வணக்கம் (vaṇakkam), which is roughly translated as 'greetings'. In Kannada culture, the gesture is Namaskara in South Karnataka and Sharanu in North Karnataka. Namaskara is derived from Sanskrit. The brahmins of Andhra Pradesh (India) use the Sanskrit word Namaskaram (नमस्कारम्) for the gesture. The usage of the same is also found across other Brahmin people in southern India. Namaste does not necessarily have to be performed with both hands. For example, if one is carrying an object in one hand, one may perform a half-namaste with one hand. A Namaste, Namaskaar or Namaskaaram greeting is never offered without the gesture. It is considered impolite, especially in South Indian culture, to use the greeting without the gesture. As it is most commonly used, namaste is roughly equivalent to "greetings" or "good day", in English, implicitly with the connotation "to be well". As opposed to shaking hands, kissing or embracing each other in other cultures, Namaste is a non-contact form of respectful greeting and can be used universally while meeting a person of different gender, age or social status. The gesture Namaste represents the belief that there is a Divine spark within each of us that is located in the heart chakra. The gesture is an acknowledgment of the soul in one by the soul in another. In Sanskrit the word is namah + te = namaste (Devanagari/Hindi: नमः + ते = नमस्ते), which means “I bow to you” – my greetings, salutations or prostration to you. Namaskār (Devanagari/Hindi: नमस्कार) literally means "I bow to [your] form".